Hi, everyone! This is Chrissy from The Taylor House! I am excited to be here again this week sharing a Bento Lunch Recipe with you at Southern Mom Cooks. I am so glad that you stopped by today to see the new lunch idea that we have to share with you this week. Every week we are sharing a new lunch idea with you. These are creative and fun Bento lunch recipes that can be used at home or sent with your kids each day to school. I have two boys in elementary and we are always struggling to find something other than peanut butter for their cold lunch, so they have loved these new weekly ideas. We are getting close to the end of the school year and Memorial Day is just around the corner! So, today I thought I would make an All Star Bento Lunch Idea that could easily be used for President’s Day, Memorial Day, 4th of July, or even Labor Day. I hope you enjoy this All Star Lunch theme! 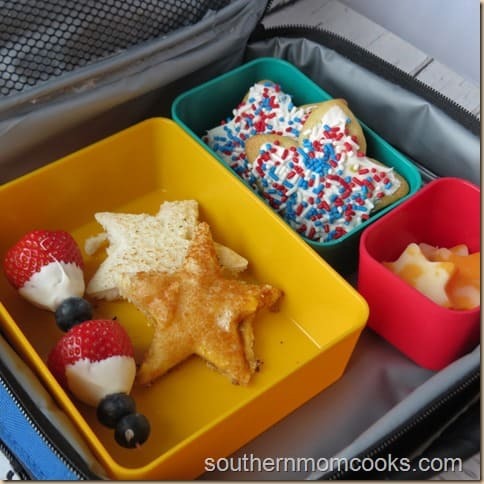 I think my boys will love this lunch idea, not only because sugar cookies are their favorite but because of the All Star theme. This was such an easy lunch to make, I hope you enjoy! Step One – Make your All Star Grilled Cheese Sandwich by grilling a slice of cheese between to buttered pieces of bread. Step Two – Make your Red, White and Blue Fruit Kabobs by simply dipping the end of a strawberry in white chocolate or white almond bark. Thread the strawberry and blueberries on a toothpick or kabob stick. Step Three – Make your Star Sugar cookies. Now, you could make a homemade sugar cookie recipe for this but I made a quick version using store bought dough, frosting and sprinkles. So, bake your cookies, frost and add sprinkles on top. Easy Peasy! This lunch is pretty easy to make and requires ingredients that I usually have on hand. Creating this new bento lunch recipe idea was very easy and I can see so many ways to use this lunch for my kids. I think they are going to love it! 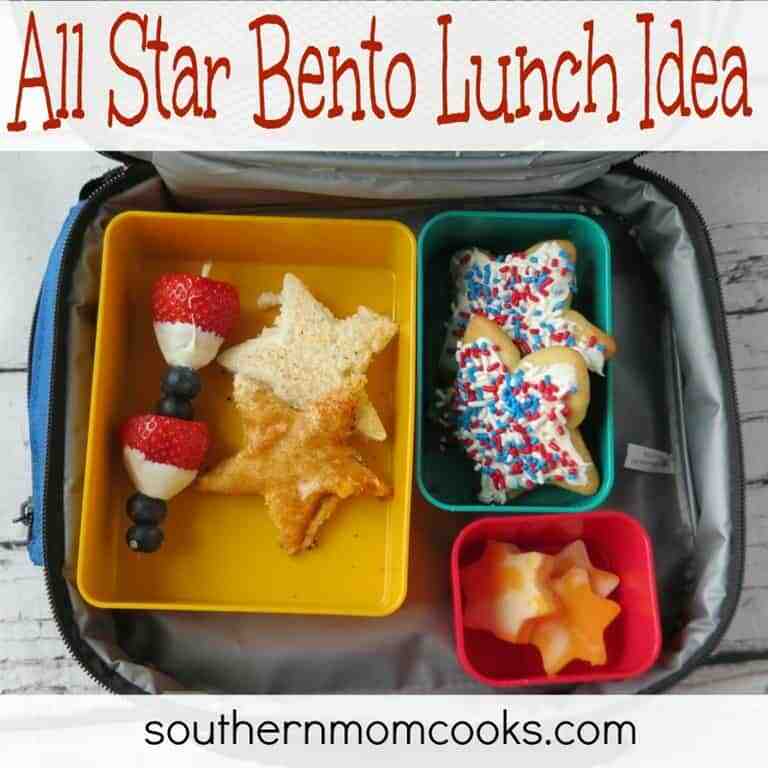 You can find more All Star and Bento Lunch Recipe posts below. Thanks for stopping by to check out our new Bento Lunch Recipe Idea! I can’t wait to share another fun and creative idea with you next week! Have a great weekend! The Taylor House * Facebook * Twitter. Hey there! Thanks so much for stopping by and linking up your yummy ideas! Stop by again next week and link up another awesome project! 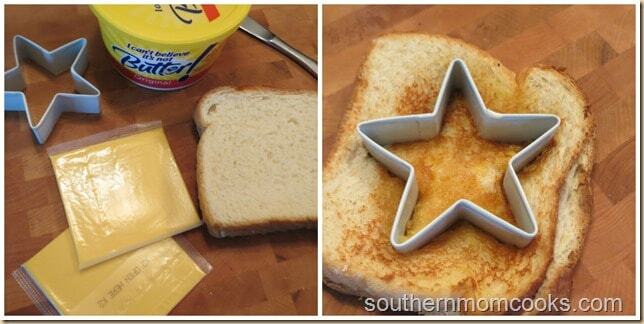 I love all the stars in this cool lunch!